Come see amazing eagles, hawks and other birds of prey on conserved lands! Lynch Canyon provides raptors with over 1,000 undeveloped acres where they can hunt and rest. 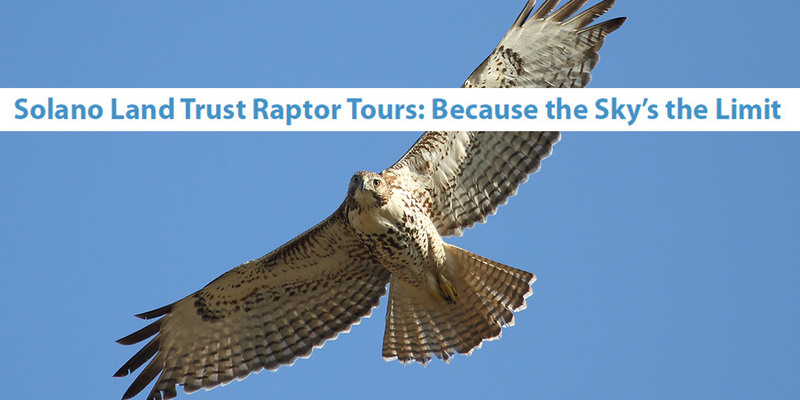 Each year from fall through late winter, Solano Land Trust docent and raptor expert, Larry Broderick, leads hikes and workshops so others can learn about the birds of prey that call Solano Land Trust properties home. During this viewing season, you can join other binocular-wielding people who appreciate the connection between Solano Land Trust's protected ranchland and open spaces and the birds that rely on those lands for habitat. Thanks to the ongoing conservation work at Lynch Canyon, and the donors who make this work possible, the land has resident yearlong raptors in addition to its wintertime visitors. During fall and spring migration, the bird population can double or triple. “It's a wild, remote wilderness, and yet it's right in our backyard," says Larry Broderick. “Lynch has a great prey base, and that is a testament to Solano Land Trust's ecosystem management." Solano Land Trust runs conservation programs year-round, manages miles of trails, and assists landowners to voluntarily conserve their land. For additional information call 707-432-0150.